In 1903 the Wiener Werkstatte (Vienna Workshops) were established with the intention of creating decorative objects whose designs were initially rendered by fine artists and then carried to fruition by master craftsmen. Josef Hoffmann and Koloman Moser were instrumental in founding the workshops and designed many of the pieces that were executed there. Currently on view at the Neue Gallery on the Upper East Side, the exhibition Wiener Werkstatte Jewelry spotlights the exquisite geometric metalwork and elaborate precious stone and pearl inlays that characterized the keepsakes produced in the Vienna Workshops. The painter Gustav Klimt's lover and renowned fashionista, Emile Floge, was the proud owner of many of these pieces, and photographs of her draped in the long necklaces and adorned with square brooches decorate the walls of the gallery, bringing the jewelry to life. 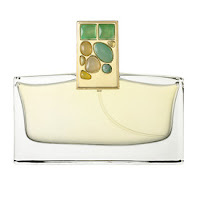 While I would love to be the owner of one of the precious pieces in the exhibit, for now I will content myself with my Estee Lauder Private Collection Tuberose Gardenia perfume bottle, whose top is inlaid with jade, citrine, and aventurine in a manner strikingly similar to Hoffman's design pieces. In addition, the scent is vibrant and sensual without taking itself too seriously, like something I imagine the elegant, playful, and statuesque Emile Floge would have worn while posing in Klimt's garden as he sketched her. 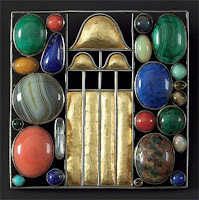 photo credit brooch: Brooch, Josef Hoffmann, 1907, Private Collection.